In a historic groundswell of youth activism, hundreds of thousands of teenagers and their supporters rallied across the U.S. Saturday against gun violence, vowing to transform fear and grief into a "vote-them-out" movement for tougher laws on weapons. 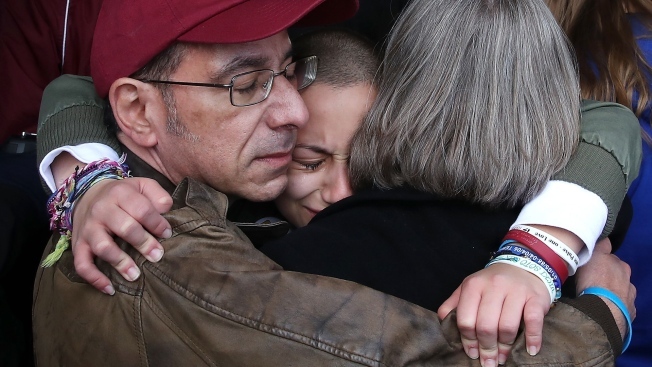 They took to the streets of the nation's capital and cities such as Boston, New York, Chicago, Houston, Minneapolis, Phoenix and Los Angeles, in the kind of numbers seen during the Vietnam era, sweeping up activists long frustrated by stalemate in the gun debate and bringing in lots of new, young voices. Marjory Stoneman Douglas High School shooting survivor Emma Gonzalez, who has become a leading voice in the student-led movement, held a moment of silence to honor the 17 people killed at her high school during her speech in Washington, D.C. When asked why he was participating in the New York City rally, former Beatle Paul McCartney said one of his best friends was killed by gun violence nearby. Fellow Beatle John Lennon was killed outside his Manhattan apartment in 1980. 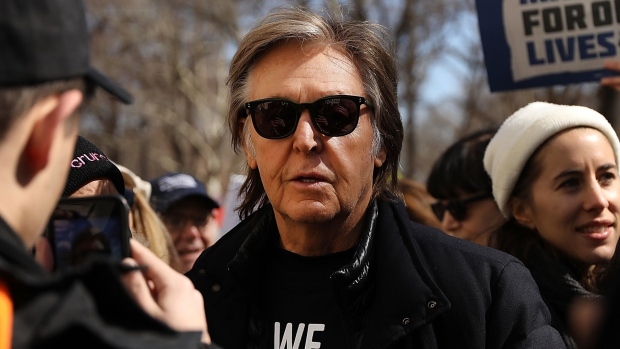 Legendary musician Paul McCarney joined protesters in New York City marching for gun control. Nine-year-old Yolanda Renee King told the crowd that she had a dream "that enough is enough," echoing the words of her grandfather, Martin Luther King Jr. She said, "this should be a gun-free world, period." Naomi Wadler helped lead her elementary school walkout on March 14 in Alexandria, Virginia. She spoke in Washington, D.C., about how kids "know what is right and wrong." 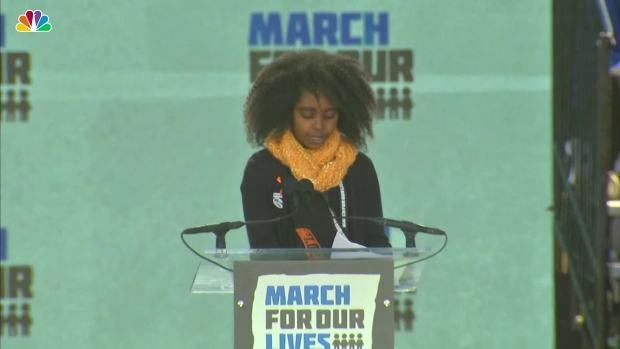 Eleven-year-old Naomi Wadler spoke at the rally in Washington, D.C., sharing stories of black girls whose lives are not talked about on the news. THE WORLD MARCHES WITH THE U.S.
France, Italy, Sweden, England and Canada all held marches in solidarity with the March for Our Lives demonstrations in the U.S.
Students in Paris and Rome marched in solidarity with U.S. students taking part in the March for Our Lives. Marjory Stoneman Douglas High School shooting survivor Samantha Fuentes led a large crowd in singing "Happy Birthday" to her fallen classmate and friend. 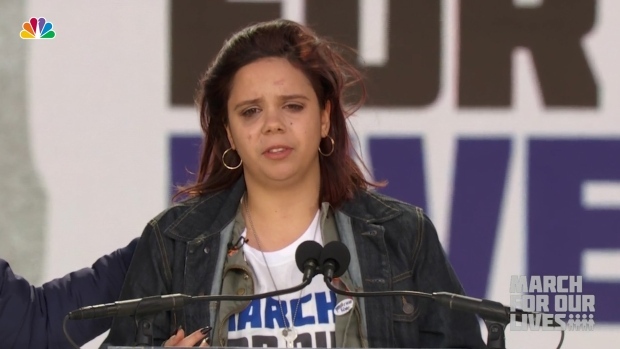 The South LA student, speaking to the national crowd in D.C., made an impassioned plea to end the gun violence in her community and highlighted how the violence affects people of color. Edna Chavez delivered an emotional speech about gun violence in her community to the crowd of protesters in Washington, D.C. The actress spoke out against the National Rifle Association at the rally in Los Angeles. Schumer has been vocal against gun violence, as two young women were shot to death in 2015 at a showing of her movie "Trainwreck."